“Article 13” is a free show that will open PIFA beginning on April 8. 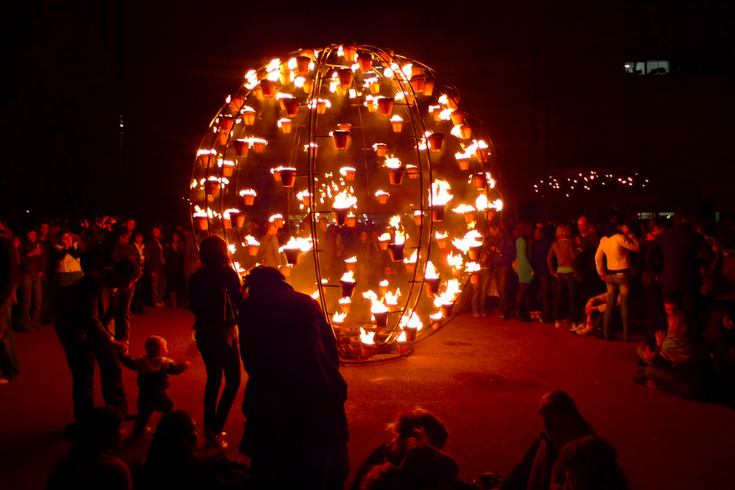 The Philadelphia International Festival of the Arts (PIFA) will return to Philly for 16 days beginning on April 8. There will be more than 60 arts events happening across the city during the festival. Tickets are currently on sale, with many starting at $10. Either search for a particular event or choose a package option. The opening performance, "Article 13," is free to attend, but since the event is on a first-come, first-served basis, reserving first-access passes to the show is recommended. Free tickets can be reserved beginning on Friday, March 18. Those with first-access passes will be able to line up for entrance early. Using sand, fire and water to tell the story of immigration around the world, "Article 13" is a multimedia spectacle that utilizes a space the size of two football fields. It will take place at Penn's Landing April 8-10 at 9 p.m.
PIFA will end the festival with a free street fair on Broad Street again this year. 2016 marks the third installment of the Kimmel Center-curated event. The theme is "We Are What We Make," and both local and international artists will participate in the art fest extravaganza through various genres and forms. One of the first events will be the American premiere of “Knitting Peace” by Swedish circus troupe Cirkus Cirkor. The performance uses a set installation created almost entirely of recycled yarn. 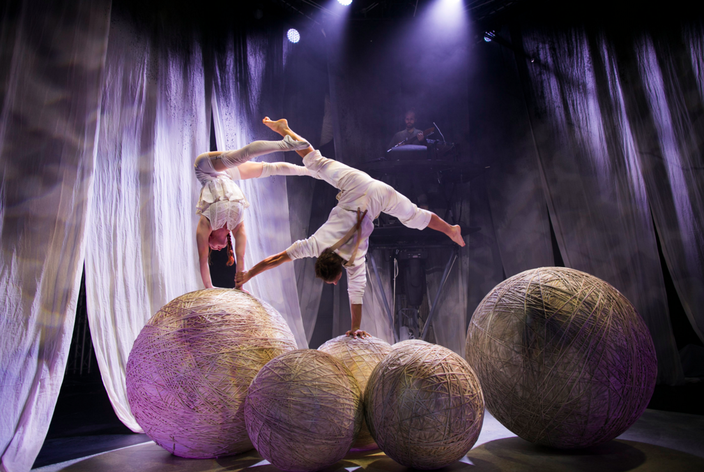 Performers in “Knitting Peace” do acrobatics on top of yarn balls. Another performance that uses unusual materials is "Paper Planet." 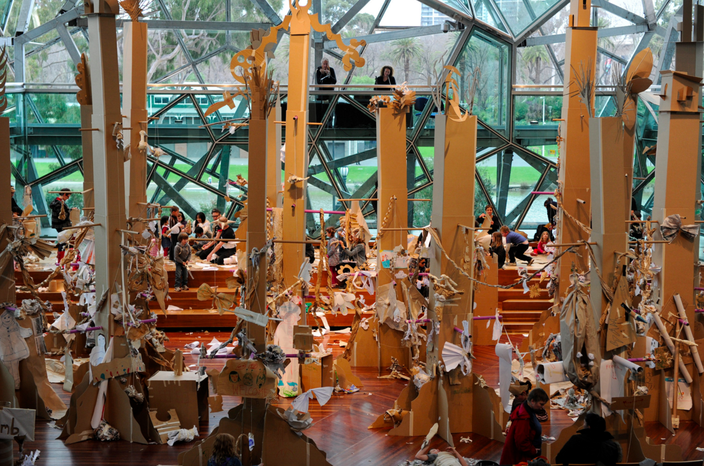 Australian-based theater company Polyglot Theatre created a forest of tall cardboard trees, inviting kids and adults to fill the world with fantastic paper creations. Each of the individual pieces in “Paper Planet” are meant for interactive engagements. Visitors are invited to touch, play with and use the paper creations. Diavolo brings two works to PIFA 2016 that explore the distinct relationships between the dangers of our environment and the human body. The program, “Architecture in Motion,” uses an abstract dome structure sitting on a reflection of itself. The dome's organic patterns in “Architecture in Motion” evoke images like craters on the moon or a honeycomb of bees. These are only a few of the arts events happening during the festival, however. The full schedule of PIFA events can be found through the Kimmel Center.